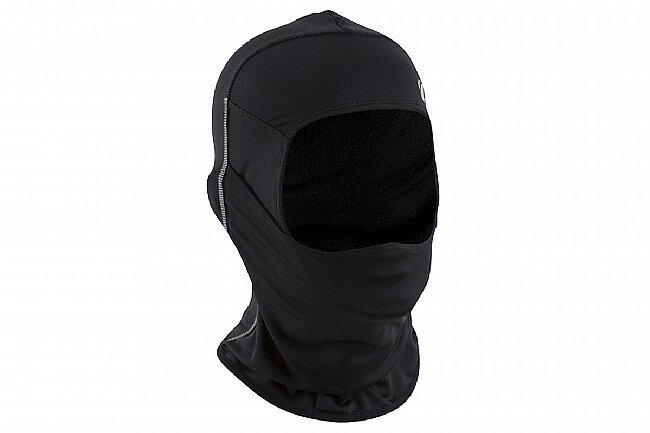 The Barrier Balaclava from Pearl Izumi is a winter weather head and neck cover with an adjustable face panel that goes all the way up for encompassing warmth, and down for ventilation or conversation. The P.R.O. Barrier forehead fabric provides wind protection while P.R.O. Thermal Dry fabric delivers insulation and rapid drying. Windproofo P.R.O. Barrier forehead panel. Warm, moisture-wicking P.R.O. Thermal Dry fabric. This balaclava works great when the temps are in the 30s to 40s - it might be a bit too warm when it reaches the 50s and I don't ride when the temps are in the 20s. The fit is comfortably snug even when I pull it down to expose my chin.